We can endlessly watch Tom and Jerry, it is always never ending fun and absolute favorite for generations. This summer Tom and Jerry set out on one of their biggest, boldest adventures yet in Tom and Jerry: Spy Quest . Get set for intrigue, thrills, suspense and high-action as the animated duo get wrapped up in a top secret, spy-tacular, fun-filled mission the whole family can enjoy together. It’s just another day at the beach for the dueling Tom and Jerry…that is until they bump into world-class junior spies Jonny Quest, Hadji and their canine companion Bandit. When longtime Quest family nemesis Dr. Zin discovers that Jonny’s father, Dr. Benton Quest, has a device to solve the world’s energy problems, he sends his evil cat army to steal it and capture him and his bodyguard, Race Bannon. Jonny and his new furry friends set out on an action-packed quest to find his father and save the world from the malicious Dr.Zin. Warner Bros. Home Entertainment brings popular, classic cartoon characters together in a brand new, action-packed, full-length animated film, Tom and Jerry: Spy Quest. 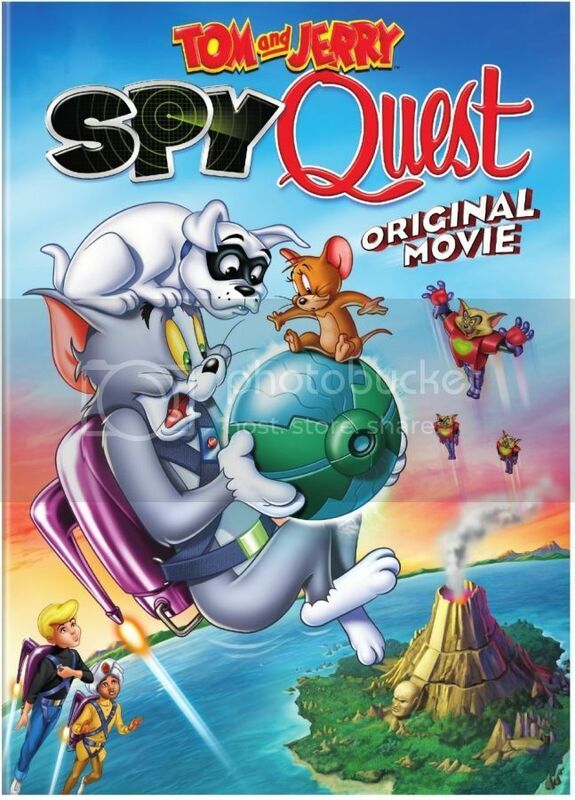 Fans of all ages won’t want to miss this heart-stopping adventure, featuring Tom and Jerry, that tussling twosome, along with Jonny Quest and his pal Hadji from the classic, action-adventure animated series The Adventures of Jonny Quest, as they embark on a dangerous spy mission in order to save the world. This entertaining new title is coming out June 23, 2015, on DVD. Tom and Jerry, originally created by William Hanna and Joseph Barbera, centers on the never-ending rivalry between Tom the cat and Jerry the mouse. Oftentimes a one-sided battle of wits, a determined Tom is fueled by the quick and clever Jerry who always seems to get the best of him in any situation. The Adventures of Jonny Quest is the popular action-adventure animated series produced by Hanna-Barbera Productions. The program focuses on Jonny Quest, a boy who goes on extraordinary adventures around the world with his father, Dr. Benton Quest, a leading scientist, their bodyguard, Roger “Race” Bannon, Hadji, Jonny’s best friend and Bandit, their pet dog. To celebrate this amazing release, all-new original animated film, Warner Bros. Home Entertainment offers one lucky Teddy Out Ready reader the chance to win a copy of Tom and Jerry: Spy Quest. The giveaway is open to US residents only, no P.O. Boxes please, and ends June 30, 2015. My favorite cartoon character is Wile. E. Coyote. I'm a fan of scooby-doo. My favorite is Tom and Jerry and I have my baby girl watching it now. It's nothing like the good ole cartoons. I really don't have a favorite. When I was a kid it was Yogi Bear & Boo Boo. Today I would have to say SpongeBob Squarepants. Popeye...Tom & Jerry and all of the oldies!! My favorite cartoon character was always Mighty Mouse! My favorite cartoon character is Scooby Doo! Thanks for the chance!